Las Vegas is a honeymoon destination for those who like shows, nightclubs, spas, casinos, golf and diverse dining. The city offers entertainment options for all budgets, ranging from free outdoor attractions to glamorous musical and dance productions. Check into a suite with a view of the city, relax by the pool, go shopping and enjoy diverse attractions and activities. 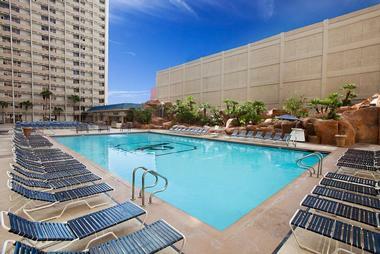 You may also like: Best Las Vegas Resort Pools. The Stratosphere Hotel in Las Vegas is known for its 1,149-foot Tower and the world's tallest thrill rides for adventure enthusiasts. High in the sky is also the rotating Top of the World Restaurant & Lounge and the Chapel in the Clouds where you can get married 100 stories above the Strip. The hotel is located on the north end of the Strip. When you stay here, it's a good idea to have a car to get around the Strip if you plan on doing some sightseeing. Hotels in the center of the Strip are about a 10-minute drive from the Stratosphere (longer during the rush hour). The hotel has a 67,000 square foot swimming pool (closed in the winter) with an oversized spa, private cabanas, bar and a cafe. Guests can relax at the salon & spa, work out at the fitness center, visit the casino and go shopping. The casino offers the ace | PLAY rewards program which lets players earn cash back and comp dollars. There are 2,427 guest rooms and suites. The Restaurant & Lounge offers elegant dining 833 feet above the road. If you are planning a special event, book one of the private dining rooms available to ten or more people. 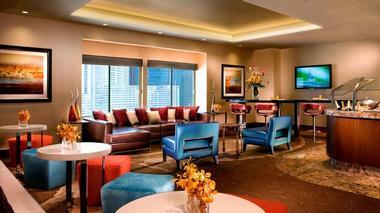 The hotel has a choice of bars and lounges, including AirBar, the highest hotel bar in Las Vegas. The 1,149-foot Stratosphere Tower rises high above the Strip, offering spectacular views. Try the Big Shot, X-Scream, SkyJump or the Insanity ride which extends out 64 feet over the edge of the Tower and spins passengers at up to three G's. Stratosphere features the tallest free standing observation tower in the United States. Enjoy indoor and outdoor observation decks with 360 degree views of the town. 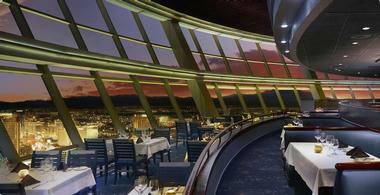 The Tower features the Top of the World Restaurant & Lounge which rotates 360 degrees while you eat. For private parties, the restaurant offers private dining rooms that can accommodate groups of ten or more guests. The Chapel in the Clouds is available for marriages and wedding vow renewals. Room rates vary by season and availability, starting at about $36 (800-998-6937, 702-380-7777). 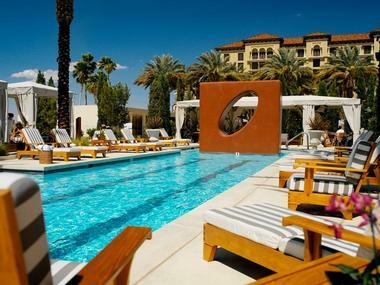 The Westin Lake Las Vegas Resort & Spa in Henderson, Nevada is a relaxing weekend getaway with Jack Nicklaus golf, a Moroccan-inspired spa and an array of restaurants. Book a room overlooking the lake to surround yourself with the soothing colors of blue and green. Guest rooms and suites are luxurious as well as affordable because the resort is not located on the Las Vegas Strip. The hotel offers a complimentary shuttle to the Strip, about 30 minutes away. The Westin Lake Las Vegas is a golfer's paradise offering a spectacular Jack Nicklaus-designed course with dramatic elevation changes and dramatic water views. White Sand Beach borders the lake and offers kayaking, fly-fishing, stand-up paddle boarding and boating. There is also volleyball, a playground for kids, hiking and biking trails. Guests can go bird watching, walking and running. The restaurants at the hotel serve innovative dishes made from locally grown products. For a special celebration head to Marssa, a AAA Four-Diamond award-winning restaurant which serves world-class Japanese and Asian-Fusion cuisine. If you are looking for a unique wedding location, at the hotel you can get married on the shores of the lake at sunset. 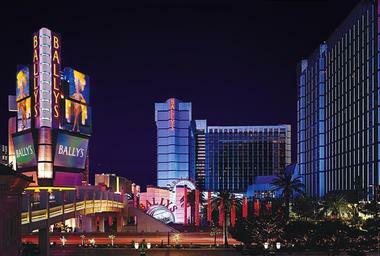 Rooms start at $99 per night (702-567-6000). 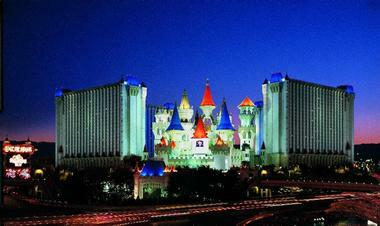 Excalibur Hotel is located next to New York-New York and Luxor on the Las Vegas Strip. The resort is designed like a castle - there is a moat, the Tournament of Kings dinner show, the Medieval Village with strolling entertainers. The lobby is decorated with medieval-style flags, shields, statues and live entertainers dressed in period costume. This castle getaway has two swimming pools, a spa, two motion film rides and a 100,000 square foot casino. The Pool Area has two heated pools, a 25-seat spa, waterfalls, water slides, and a shaded dining area. The Tournament of Kings Dinner Show is a popular musical production inspired by the legend of King Arthur. The show features jousting, dragons, fire-wizards, and dinner. The show takes place twice each evening at 6pm and 8:30pm and costs $55 per person. During the show, visitors are served dinner. Tickets are available 30 days in advance. There are 2,000 Widescreen rooms featuring 42-inch plasma screen TVs, pillow top mattresses, contemporary bathrooms with granite countertops, and alarm clocks with iPod inputs. The hotel is built in the shape of a medieval castle. Widescreen rooms are located close to the pool and spa, offering great city views. The casino offers 2,250 slot, video slots, video poker, and video keno machine ranging from $25 to 1 penny. There are blackjack tables, Spanish 21 tables, shoe-dealt tables, roulette wheels, crap tables with double odds, Progressive Pai Gow poker, Caribbean Stud poker, four Let-It-Ride, Mini-Baccarat, Casino War table and Big Six Wheel. Free lessons are available daily at the casino. The casino has a 105-seat keno lounge and a 150-seat race and sports book with a big screen and a full-service bar. 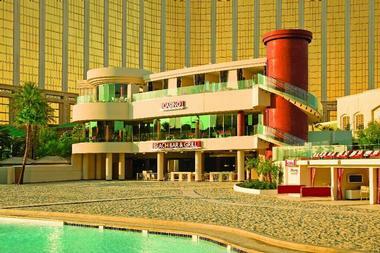 VacationIdea.com Vacation Tip: The hotel is connected with Luxor and Mandalay Bay Resort and Casino with a monorail. Don't miss a visit to the interior of the Luxor pyramid - it's free. Room rates vary depending on season and availability, starting at about $70 per night on weekdays, and from $160 on weekends (800-937-7777, 702-597-7777). Circus Circus in Las Vegas is home to Adventuredome, America's largest indoor theme park. The hotel is also famous for its circus acts - clowns, aerialists and Ringmasters perform twice per hour from 11am to midnight. The shows are free of charge. >The Midway Stage above the main casino is featured in the Guinness Book of World Records as the world's largest permanent circus and is a fun stop the whole family can enjoy. ou will find 21 rides and attractions with Grand Canyon-like scenery as a backdrop (there is a fee for each ride). Other things to see and do include the IMAX RIDEFILM Cineplex and the third-floor Promenade for shopping. The Casino Tower features two casinos, a race and sports book, circus arena, carnival midway, game arcade, multiple dining facilities, wedding chapel and retail outlets. There are 3,638 guest rooms and 135 suites located in two towers and the Manor. The Skyrise Tower is a 29-story tower with 1,188 guest rooms, its own casino and pool. The West Tower is 35 stories high with 999 guest rooms, hotel lobby, shopping Promenade and dining facilities. The attraction can be accessed through the Promenade. The Manor offers five three-story buildings with 810 guest rooms. Dining choices include a steak house, an Italian restaurant, Mexican cuisine, pizza and fresh pastries. The Buffet seats 1,005 and is one of the most popular buffets in town. After watching exciting circus acts and experiencing the thrill of rides, who isn't hungry? Circus Circusis home to Adventuredome, a five-acre theme park home to the Canyon Blaster, the world's largest indoor double-loop, double-corkscrew roller coaster in America. Room rates start at about $40 per night (877-224-7287). 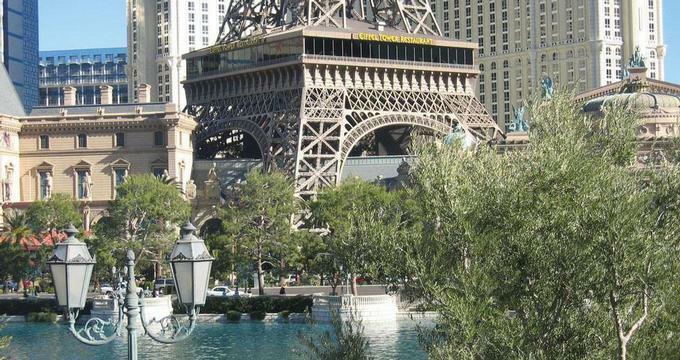 If you are looking for a quick Vegas weekend getaway, Bally's Las Vegas is a 44-acre property located across from Caesars Palace and next to Paris. It is connected to the MGM Grand with a mile-long free monorail. Bally's Plaza marks the entrance to this grand resort, complete with 200-foot people movers, landscaping, light, water and sound displays that provide a dramatic night spectacle. There are 2,814 hotel rooms and suites situated in two 26-story towers. A standard guestroom measures 450 square feet in size, while suites range from 900 to 2,600 square feet. 22nd Club is an exclusive concierge floor with a private lounge overlooking Las Vegas. There is a 70,000 square feet of casino space and is home to the world's first $1,000 slots. Choose from more than 75 betting tables and other casino games, including blackjack, baccarat and mini-baccarat, roulette, craps, Let It Ride ®, Caribbean stud poker, pai gow poker, wheel of fortune (big six), and a keno lounge. Bally’s Avenue houses 20 unique stores in a contemporary setting. Try, for example, Houdini's Magic Shop which sells professional-grade tricks, spells, and magical gizmos. Accomplished magicians at the store are ready to perform any trick available and even give you private instruction in a secret room. The area also includes a wedding chapel, beauty shop, race and sports book, and three restaurants. The spa measures 15,000 square feet, complete with fitness facilities, whirlpool spas, steam rooms, saunas, Vichy showers, hydro tubs and treatment rooms. Book a relaxing massage on your getaway. The pool complex, complete with lush gardens, contains an over-sized heated pool, spa, cabanas, a cafe, bar and tennis courts. If you are looking to play some golf, guests can play at the exclusive Cascata golf course designed by Rees Jones, located just 30 minutes from the Strip. After dining at one of the hotel's five restaurants, see a show at the 1,040-seat Jubilee! Theater with a cast of 100 performers, including acrobats, dancers, singers, showgirls and aerialists that perform on lavish sets. Each week Jubilee! uses more than 4,200 pounds of dry ice and 60 pounds of explosives for unforgettable special effects. Free attractions to see nearby include the Bellagio fountains, the Eiffel Tower replica, the Sirens of TI and the Lake of Dreams at the Wynn (888-742-9248, 702-967-4405). 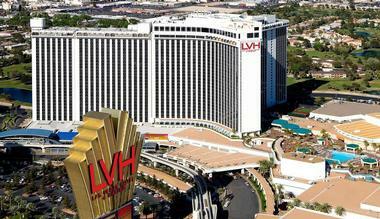 LVH offers its visitors exciting entertainment, dining and gambling. After you are greeted by the life-size statue of The King in the lobby, visit the pool, health spa and three distinct casinos: the Main Casino, the Race and Sports SuperBook and the SpaceQuest Casino. The renovated hotel is an affordable off-Strip idea. During his 800 performances, Presley stayed in the famed, 5,000-square- foot Elvis Suite on the 30th floor which today houses luxury Sky Villas. There are 3,000 rooms and luxury suites. At night, guests are entertained at the Hilton Theater, enjoy jazz and dancing at Crystal Lounge and DiscoNights three nights a week at The NightClub. The pool and recreation deck features private cabanas, spa and fitness center, championship tennis courts and Cabana Bar. Although pool operation is seasonal, the spa and fitness center are open year-round. The spa offers massages, body wraps and facials. Extra charges apply to gain access to the pool and recreation deck. The richly appointed Main Casino features a large selection of table games, including Blackjack, Roulette, Craps, Pai Gow Poker, Three-Card Poker, Let It Ride, Caribbean Stud and Baccarat. There are over 1,400 slot and video poker machines. The Race and Sports SuperBook offers betting on sports and racing from around the world. Dining options at the hotel range from Mexican and Italian to Japanese cuisine. There is even the Quarks’s Bar and Restaurant at Star Trek Las Vegas center where you can try 24th century eats such as the Wrap of Khan, a Hamborger or Tribble Tenders. Room rates start from $49 USD per night, depending on season and availability (888-732-7117). 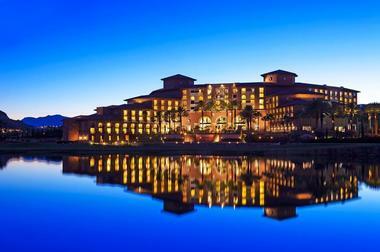 Green Valley Ranch Resort, Spa and Casino is located on 40 acres in Henderson, Nevada. The resort features Mediterranean-style design. The resort's 8-acre pool area offers a stunning view of the Strip, a sand beach, a disappearing-edge waterfall and a bridge that spans its entire length. The resort offers 500 rooms and suites that combine old-world style with modern amenities. Room rates start at $90 per night. The property was showcased in the Discovery Channel reality program "American Casino," for three seasons, making it a famous vacation destination. Enjoy the unique spa, pool and elegant guest accommodations. There are over 80 luxury suites, including the romantic Tuscany Suite and the Grand Suite, both offering a jacuzzi tub. Dine at the resort's diverse restaurants, book at couples massage at the spa and enjoy the nightlife. There are 10 restaurants for nearly every taste and budget. Feast Around The World Buffet features freshly prepared food offerings from around the world, featuring six live-action cooking stations and serving Italian, American, Mongolian, Chinese and other international specialties. The 30,000-square-foot spa is situated in the beautiful pool area. The stand-alone, multi-floor spa offers 22 private treatment rooms and a couples suites, an outdoor lap pool, fitness center and a steam room. The spa features Zen-inspired design with teakwood walls, natural shades and soothing sounds of water. Travelers get to try the first glass-ceiling treatment rooms in the U.S. The glass bottom of the reflecting pool in front of the spa forms the ceiling. Relax in the private VIP lounge next to the fireplace before your treatment. There is also a full-service salon (702-617-7777, greenvalleyranch.sclv.com). Harrah's Hotel is located in the heart of town, next to the Venetian. The hotel has an outdoor swimming pool, spa & health club, beauty salon and seven restaurants. This is an affordable place to stay in town, with rooms starting at just $32 per night. Chocolate enthusiasts can head to the Ghirardelli Chocolate Company located in Carnaval Court The smell of chocolate and coffee is difficult to resist in this shop serving ice cream, shakes, sundaes, chocolates and coffees. >Choose from several entertaining shows featuring dance, music and comedy. The casino measures 86,664 square feet in size and participates in the Total Rewards program which lets you earn Reward Credits which can be spent at Harrah's, Rio, Showboat and Harveys casinos. There are 2,500 rooms and suites. Dining options range from Italian food to stakes and seafood. Streaks Bar & Grill is located within the Sports Book so that you don't have to miss any of the action. The spa offers massages, aromatherapy, facial and body treatments designed to relieve stress. Located on the fourth floor of the Carnaval Tower, the spa is accepts appointments at 800-392-9002 ext. 5189. Services at the Beauty Salon include hair styling, manicures, pedicures and makeup application. Stay in shape by visiting the health club which also offers a steam room, whirlpools or sauna. The facility fee is $20.00 per day for hotel guests. The hotel can prepare a gift basket and have it delivered to your guest room. Spa baskets includes a terrycloth robe, bottles of shampoo, body lotion, shower gel, and bath scrub, and a hair brush set. Prices start at $120 (call 702-693-6095 to order). VacationIdea.com Tip: Take a romantic gondola ride at the Venetian, visit an art museum, watch the Mirage volcano, Lake of Dreams, The Sirens of TI, or see the free show at the Fountains of Bellagio. Room rates depend on when you go. You can find a cheap deal for $32 per night, or end up spending $189 on a busy weekend (800-392-9002, 800-392-9002). The Shark Reef Aquarium at Mandalay Bay contains all kinds of incredible sea creatures. Designed to be an immersive experience, the aquarium has fourteen exhibits that hold some of the world's most exotic sea creatures. The main attraction at the aquarium is a 1.3-million-gallon shipwreck tank where guests can get 360 degree views of a unique underwater habitat. The aquarium is home to more than 2000 animals, including 15 different species of sharks and more than 100 different types of fish. 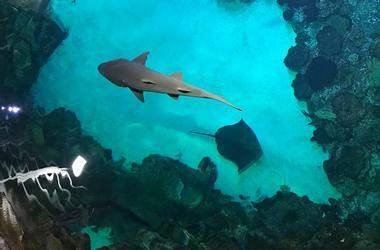 At the touch pool, guests can stroke sharks, rays, and horseshoe crabs. The Quad is located in the heart of the Strip between Harrah's and Flamingo, across the street from Caesars Palace, and offers affordable rooms. The hotel features a 125,000 square foot showroom with over 250 classic, vintage, antique and collector cars. The hotel has a spa, seasonal swimming pool, casino and several restaurants. The 75,000 square foot casino offers a Player Club which lets you earn points and comp dollars. The hotel has a race & sports book, tournaments and a variety of games. A unique feature at the casino is the Dealertainers Pit featuring celebrity impersonators on the casino floor. You may get entertained by Cher, Ray Charles or Elvis while gambling. Play golf on one of the 33 golf courses available through the hotel, and go shopping. Ask for one of the rooms with a view of the Strip so that you can watch the action all night. The hotel has 2,640 guest rooms. There are nine restaurants, featuring Asian cuisine, seafood, steaks and Southwestern home-style barbeque. Doubles start at $66 per night on weekdays, but the rates can be three times that on certain weekends and during conventions (800-634-6441). Planet Hollywood Las Vegas offers a selection of stylish accommodations, including luxury themed suites popular with rock stars which make perfect honeymoon suites. Enjoy spacious bathrooms with oversized soaking tub, seamless shower and marble vanity. There is a diverse selection of dining and entertainment. A European-style spa lets you relax, rejuvenate and order healthy spa cuisine on your luxury honeymoon. Nightlife options include Heart Bar, Prive or The Playing Field Lounge. Room rates start at $109 per night. Choose from standard rooms and luxuriously appointed suites with panoramic views (866-919-7472). TheHOTEL at Mandalay Bay provides couples with luxury suite accommodations and easy to access to shopping, dining and entertainment. TheHOTEL is located on the southern end of the city. Mandalay Bay is connected with Luxor and Excalibur with a monorail. The three properties offer a selection of dining, shows and attractions such as the Shark Reef at the Mandalay Bay Resort, the Tournament of Kings dinner show and a pyramid. Travelers who like to take baths with a view can book a Spa Suite with a spa tub next to the window at the Monte Carlo. 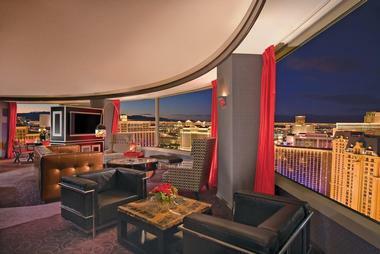 For best views, ask for one of the Spa Suites that overlooks the Strip. Monte Carlo offers a luxury spa, shopping and a 21,000 square-foot pool area, open in season. Water enthusiasts can visit the Wave Pool with waves that reach 30". There are several Spa Suites with a spa tub in front of a large window overlooking the city or the nearby mountains. The suites have Italian marble bathrooms, Wet Bar and a separate wet sauna and shower. Rooms start from $80 per night; Spa Suites from $310 per night. Platinum Hotel and Spa is an all-suite non-gaming hotel located a block and a half from the Las Vegas Strip. Enjoy the generously-sized suites measuring 950 to 2,200 square feet in size, Well Spa and a sophisticated pool deck on your weekend trip. Choose from 255 one- and two-bedroom suites with gourmet kitchens, whirlpool tubs, plasma screen TVs and wireless Internet. Well Spa offers a menu of unique body treatments, facials, and aromatherapies, including massages, manicures and pedicures, and couples' treatments. Take a relaxing yoga class on the pool deck. The class is complimentary for hotel guests. More spas. If you need help with show tickets, transportation from the airport, dining reservations and other services, contact the concierge desk before you go. Plan a trip to the famous Red Rock Canyon and take the 13-mile scenic drive through colorful cliffs, or explore the park on foot. There are designated mountain bike trails, horse-back riding as well as guided hikes lead by park experts. Dining is offered at Kilowat Restaurant, Stir Lounge and in-suite. Suites start at $129 per night (877-211-9211). The Bellagio Conservatory and botanical gardens are also known as Bellagio's Arcadia. 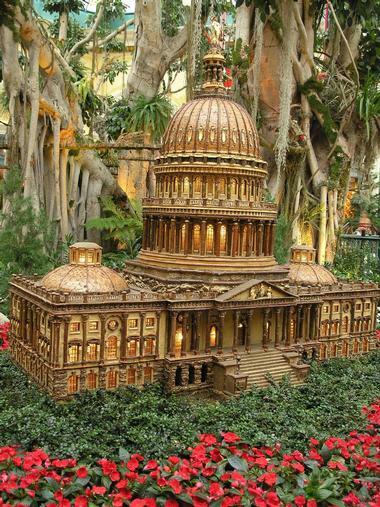 Every season, a team of 120 talented horticulturists and designers create breathtaking displays of seasonal plants and trees. Along with displays for summer, winter, fall, and spring, the conservatory also designs a special exhibit for Chinese New Year. Ninety percent of the plants used in the exhibits are recycled, and some displays contain upwards of 50,000 trees, plants, flowers, and shrubs. There are upscale restaurants, cafes, and shops within walking distance of the 14,000-square-foot display area. The Bellagio features a man-made lake with a spectacular display of water, music and lights. If you are planning to splurge on your trip, book one of the AAA Five Diamond Award-winning rooms with a view of the lake and watch the spectacle straight from your room. Have a romantic dinner at one of the resort restaurants that overlook the Fountains - Le Cirque, Picasso or Olives. Decorated in a South Seas theme, the Mirage offers couples a heated tropical pool area with two pools, several lagoons, palm trees and grottos. The pool is open year-round, except for one month of the year (usually December). Access is available only to hotel guests. For those who want to stay in a luxury suite, the Mirage offers spacious suites decorated with imported silks, hand-loomed carpets and other stylist accents. The hotel is home to the Mirage Volcano, a free outdoor spectacle that erupts in lights, water and roaring sounds every hours when the night falls. There is also shopping, a spa, several dining options and the casino. The Mirage is across the Strip from the Venetian and a 20-minute walk from the Bellagio. The Venetian offers couples activities ranging from romantic gondola rides and shopping along a replica of the Grand Canal to pampering at the Canyon Ranch SpaClub and dining in 17 different restaurants. All guest accommodations at the Venetian are suites. For additional service and privacy on your honeymoon, try a Concierge Level Suite. These suites are located on the top five floors on the west side of Venezia tower. Couples staying at Treasure Island can rent one of the luxury poolside cabanas or the VIP loft next to the renovated resort pool. The cabanas feature a LCD TV, poolside chair massages and a personal host to cater to the couples' wishes. The pool area at TI features a 50 person jacuzzi and a bar serving tropical drinks. Watch the Sirens of TI show at night while taking advantage of VIP viewing available to guests, see a show or visit a nightclub. The hotel offers a choice of casual and elegant restaurants. New York-New York Hotel features replicas of New York landmarks, restaurants and shops. The Spa Deluxe guest rooms are well suited for a romantic trip because they offer a clover shaped spa tub in a corner of the bedroom. If you dare, ride the Manhattan Express roller coaster which rises high above the city. At night, book a table at Il Fornaio, serving Northern Italian dishes, delicious desserts and Italian coffees. Madame Tussauds gives you a chance to interact with some of the world's biggest icons. Take a picture on stage with Elvis, go one-on-one with Shaquille O'Neal and put with Tiger Woods. The museum is located in the heart of the city at the Venetian resort. General admission is $22.95; seniors, students and Nevada residents pay $17.95; children aged 6 to 12 pay $12.95; and kids under 5 enter for free. For more information and hours, call 702-862-7800.